It’s easy to drive past the tiny hamlet of Évol. But thanks to its “Most Beautiful Village of France” classification, I took the time to find out about this charming village. 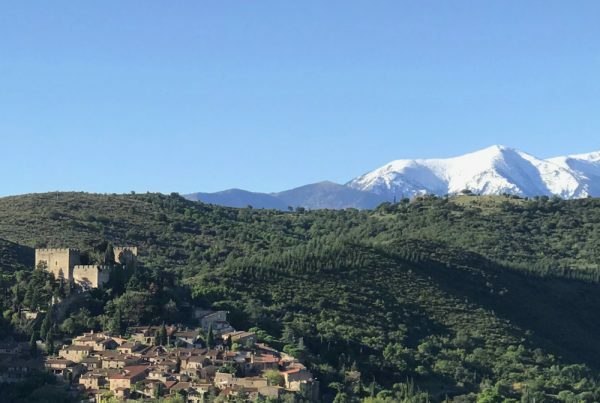 Nestled in the mountains of the Haut-Conflent, Évol is a remarkable place that overlooks an old fortress that belonged to local Viscounts. The village itself is rather small; however, there are some really nice walks in the area. 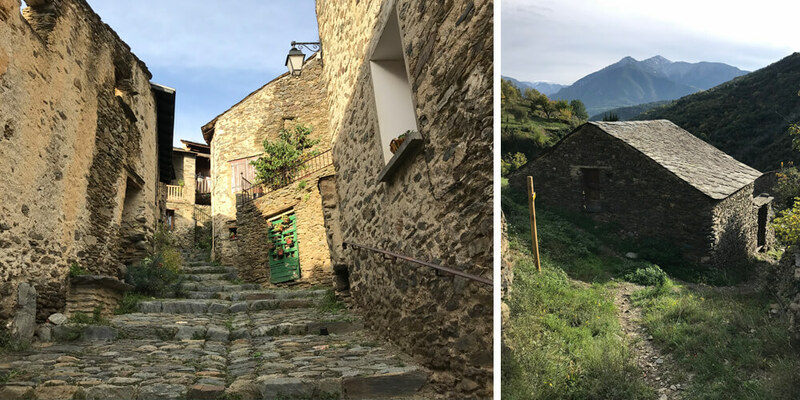 Évol is a village built in the typical, rural, mountain architectural style of the Haut-Conflent area. All of the houses seem to be made out of the same grey shale and bluish schist – locally known as “lloses” – covers the roofs. It’s like time has stopped. Normally, there is a big parking lot outside a “Most Beautiful Village of France”. Évol is so tiny though that I couldn’t find one and I parked on the side of the road. As Chéri and the kids didn’t want to come with me, I told them that it wouldn’t take long to walk around Évol. 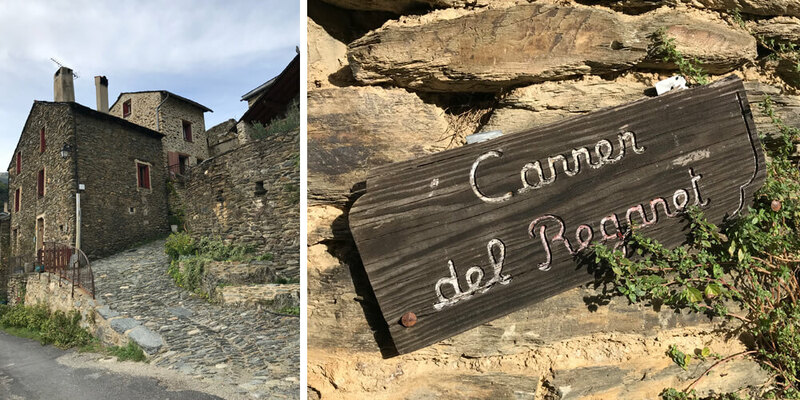 I started exploring the hamlet by climbing the Carrer del Reganet. Not only are the houses made of shale, but the cobbled streets are also paved with the same stones. Évol has produced shale since the 13th century, so the quarries brought a significant income to the region. I decided to climb all the way to the end of the street, to get an overview of the hamlet and to see where I was going. 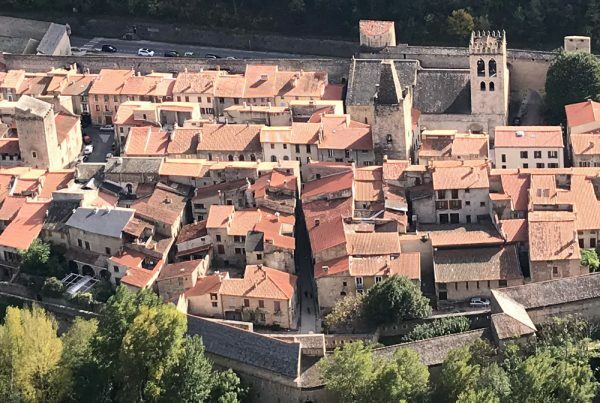 From the top of Évol, I got a beautiful panorama of the medieval hamlet. In the 14th century, Évol was at the centre of an important Viscount’s territory, and the village itself was mentioned as far back as the year 957. 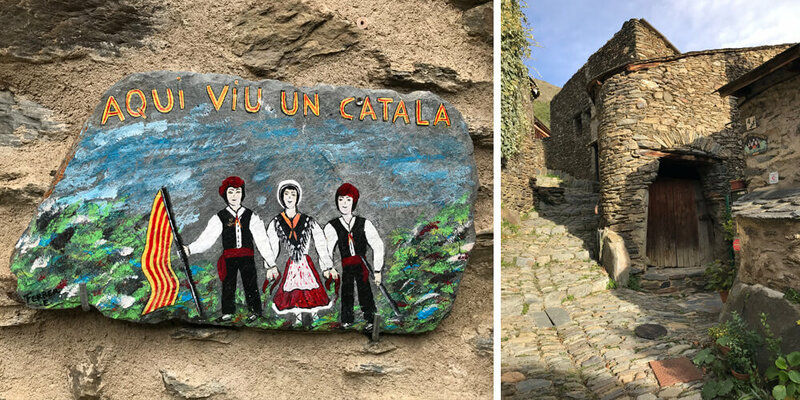 Like other villages in the area, Évol still has Catalan influences, and its inhabitants are proud of their roots. There, at the top of the village, I saw two interesting walks I would have loved to do. But with Chéri and the kids waiting for me, I felt a bit pressured. And Évol is exactly the sort of place where you shouldn’t feel pressure or stress at all. The first walk, “Sur Les Toits d’Évol”, only takes half an hour. 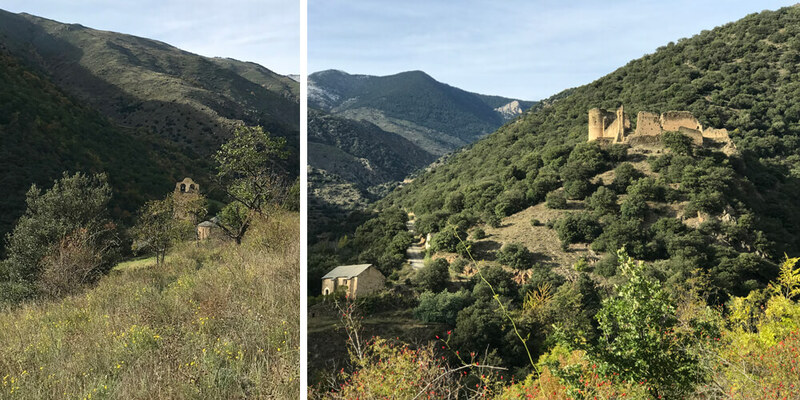 Quickly, I started walking the first bit so that I could get a closer look at the castle, built by King James II of Aragon in 1260, and Saint Andrew’s Church built in the 11th century. 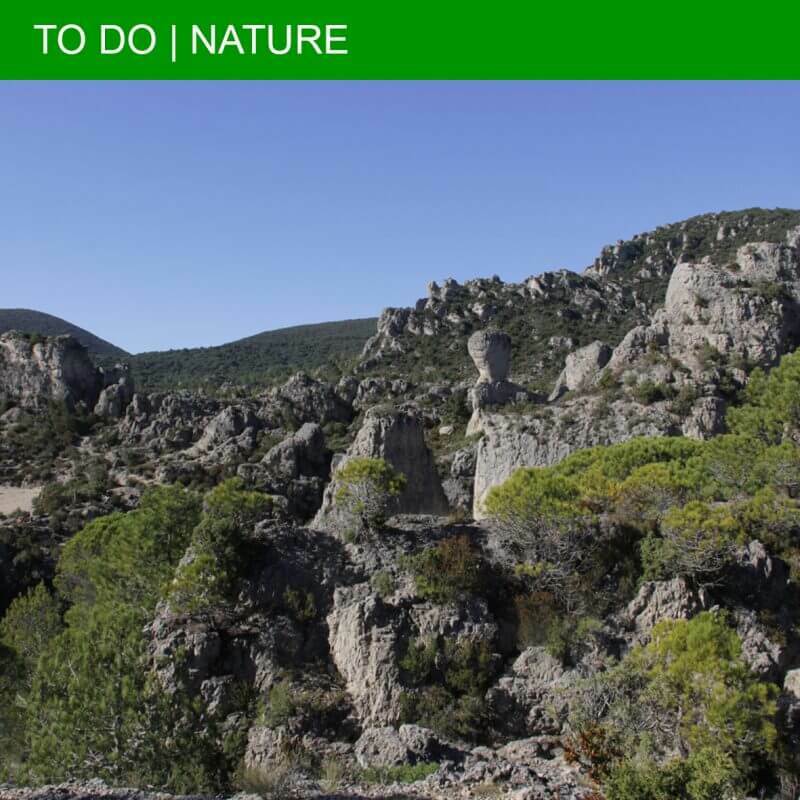 The second walk, “Le Chemin de Ronde”, is more of a hike and takes 1.5 hours. So I’ll have to save that one for another time. Évol neighbours to the village of Olette, and you can reach it by following the hairpin road. 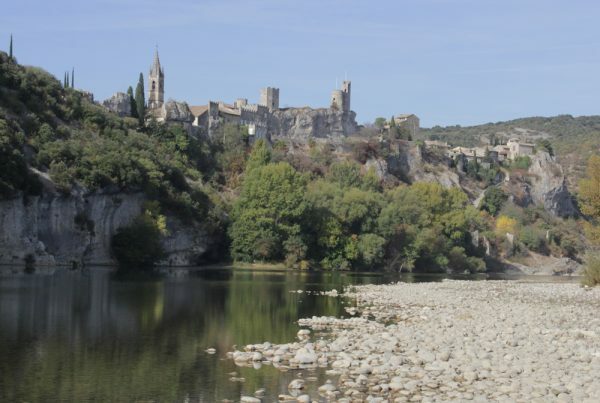 It is one of the “Most Beautiful Villages of France”. 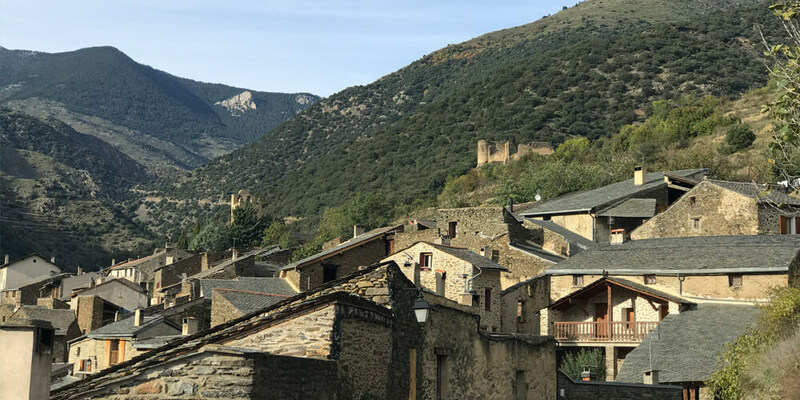 Évol itself doesn’t have a tourist office; however, the regional tourist office of Conflent Canigo is located in Prades and can provide you with more information.